The bizarre-looking blue wildebeest or 'brindled gnu' relishes open plains for grazing. The blue wildebeest is a very athletically built antelope. Its muscular, lean build and broader chest and shoulders, together with its cattle-like horns and its dark brown-black color, are its major identifying features. From afar they may resemble buffalo, but are much smaller in size, and have smaller horns. These antelope are quite big and can reach weights of up to 274kg, but generally, in the Kruger National Park, their average weight ranges between 171 and 242kg among males and between 141 and 186kg for females, a more profound difference than most other antelope found on grass plains. Both sexes have horns. The range in which these antelope are distributed stretches from just north of the Orange River in South Africa into Namibia's western reaches. In East Africa, the plains of which it so magnificently dominates, it can be found from the southern borders of the Kruger National Park, through Zimbabwe, Mozambique and secluded parts of Zambia to its home grounds where populations of over one million live together, on the famous Serengeti plains of Tanzania, through to Kenya. The areas of land on which blue wildebeest can be found stops just short of the equator and excludes areas with high rainfall. The great migration of blue wildebeests across Tanzania alone accounts for over one million animals. This, along with the further estimated 1.5 million of these animals that can be found across Sub-Saharan Africa, make this species a definite member of the ‘least concern’ club. Growing rural settlements and new farmlands do contribute to the loss of habitat for most wild animal species, but their choice of drier regions in which to live makes for less desirable farmland and restricts communities from overtaking them due to a low levels of water and natural resources overall. These antelope are definitely not under threat and are very stable going forward. Blue wildebeests are primarily grazers, preferring short grass that densely covers the landscape. They can mainly be found within drier and more arid savanna, grassland and woodland areas, including the notorious Miombo woodland areas of Zambia, too infertile for most animals to thrive in. Semi-desert areas and pans like those found in the Kalahari Desert region also fit the bill for a habitat for these creatures. 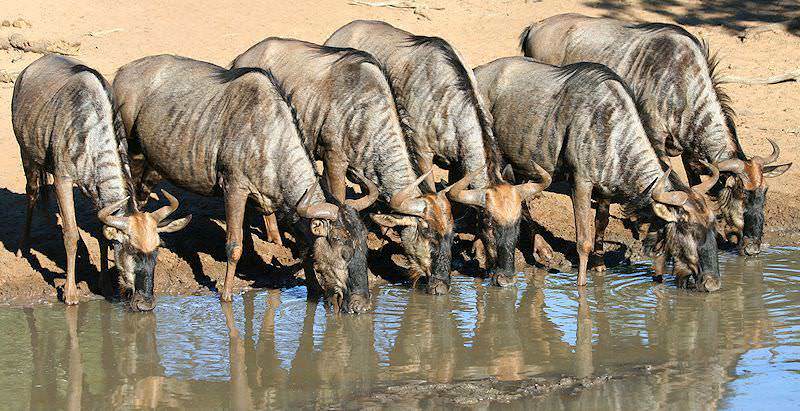 Blue wildebeest are peculiar in the sense that they naturally favor areas generally ‘harder’ to survive in, with resources more scarce and water harder to come by in addition to the naturally less fertile soil that go along with it. Blue wildebeest are very territorial and gregarious creatures. Maternal groups wander around their home range that may include a few male territories, while bachelor groups are formed by juvenile males and males that do not have a territory. This structure usually changes during the dry season when resources become even scarcer than before and the wildebeest populations are forced to find other environments to sustain themselves off of. This process is called migration and during this journey herds generally merge into one large group. The great migration of wildebeest in the Serengeti is the best example of them merging at the start of the dry season to find greener pastures elsewhere. Unlike most species of antelope, the common wildebeest starts its day with ‘challenge rituals’ among neighbors to maintain territorial statuses, lasting an average around 7 minutes, with many different ritual activities being performed during this time. Defecation and urination are again used to spread scent and mark territory in addition to secretions produced by their pre-orbital glands to make the borders of their property smelled and known by challengers nearby. Oddly enough, battles between bulls over territory violations are uncommon, with the usual response simply an evasive ‘duck and dodge’ approach rather than going down on their knees and locking horns or chasing one another like other antelope species. Blue or common wildebeests are very strict in nature when it comes to mating and as a result birth times during the year, with a distinct three week birth peak period when conditions are preferred and offspring have the best chance of surviving the first month of unprotected life outside the comfortable wombs of their mothers. Their calls for courtship, courtship itself and mating practices are very conventional. This is followed by a rough and vulnerable 8 to 8.5 months of pregnancy before the first sight of their gorgeous additions to the herd. Females may conceive as young as 1 year and 4 months in favorable conditions. Stotting, standing up straight or erecting their posture and making snorting sounds are the routes usually taken by common wildebeest, from a distance. When predators react aggressively or come too close for comfort, these gnus, as they are sometimes called, take the high road and run for dear life. Lions, leopards, spotted hyenas, wild dogs and crocodiles pose the greatest threat to adult wildebeest. Adolescent or juvenile wildebeests are tormented by pythons and cheetahs in addition to the enemies of their parents. They are especially vulnerable in the first few weeks of their lives. South Africa is an alluring destination steeped in incredible diversity. Namibia's most popular destinations include Sossusvlei and Etosha. Zambia's near-untouched wilderness areas offer truly rewarding safaris. Zimbabwe's allure lies in the dramatic appearance of the Victoria Falls. Travel to Mozambique for the ultimate barefoot luxury vacation. The Kruger National Park is South Africa's premier destination, incomparable in its diversity, size and fine infrastructure. The Sabi Sand Private Game Reserve conserves 65 000 hectares of pristine Lowveld wilderness and ample wildlife. Cape Town is South Africa's top tour destination, offering an extraordinarily wide and diverse range of activities and attractions. The Garden Route is an alluring destination that will appeal to both the leisure lover and the adventure seeker.